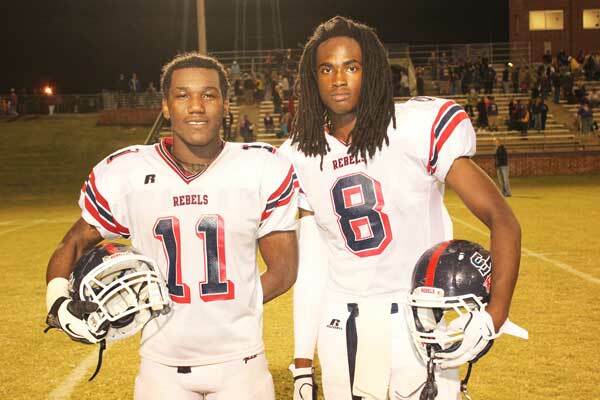 #11 Darius Hammond, running back for Strom Thurmond High School and #8 Aaron Cook, Strom Thurmond linebacker. These two student athletes have been selected to play in this year’s Shrine Bowl of the Carolinas. Last week’s announcement of 2012 selections for the prestigious Shrine Bowl of the Carolinas hit close to home twice. Strom Thurmond running back Darius Hammond and outside linebacker Aaron Cook have been named to the 2012 team. The Shrine Bowl coaching staffs selects forty-four players statewide each year. Players nominated must be graduating seniors and the Shrine Bowl administration requires that all nominated players must meet the scholastic and attendance requirements of his respective school and/or school system. Furthermore the committee states that any felony conviction or involvement in drug-related crimes or problems may lead to non-participation in the Shrine Bowl game, as the player may be ineligible. Strom Thurmond selectee #11 Darius Hammond grew up in Johnston, South Carolina and matriculated through Johnston Primary and JET Middle School into Strom Thurmond High. He has maintained a solid B academic average and is well known as a quiet non-pretentious young man with a bright future ahead. Darius has rushed for 907 yards, gained 174 passing yards and scored 18 touchdowns as of this publication. #8 Rebel Linebacker Aaron Cook made his way to Strom Thurmond via the Merriwether elementary and middle schools. Aaron has a 4.0+ GPA and is very likely on his way to becoming a physician. Aaron has been credited with 57 tackles this season that includes a quarterback sack. When talking to these young men it is easy to tell that they are both gentlemen and serious about what they do with their lives. The Shrine Bowl game is the nation’s oldest and most prestigious high school all-star game. The first Shrine Bowl of the Carolinas was played December 4, 1937 in Charlotte, North Carolina. The game is played each year to benefit the Shriner’s Hospital for Children. This year’s game will be played Saturday, December 15th at Gibbes Stadium, Wofford College in Spartanburg, South Carolina. Kick off is scheduled for 1:00 p.m.